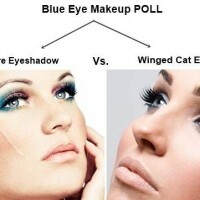 My search for that perfect neutral brown lip-color might just have ended – all thanks to Maybelline! A shimmery shade from their Color Sensational Tinted lipstick range, this one is 775 Copper Brown. The description reads – crisp color from pure pigments and creamier feel from nourishing honey nectar. It has built-in lip balm with SPF 15 sun protection. 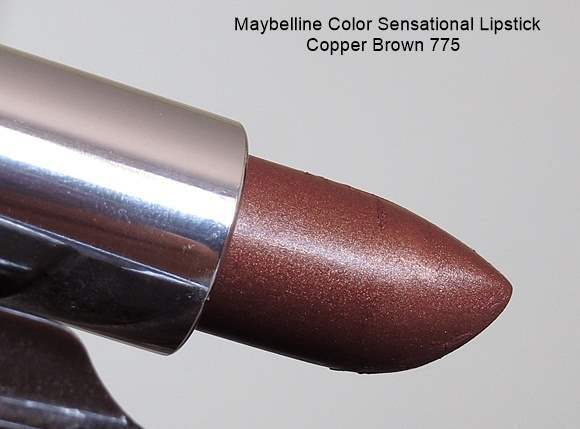 Maybelline describes it as lipcolor so rich, so stunning, it’s sensational. It is their standard packaging of a rectangular frame with metallic silver base and a reddish-brown opaque cap. The product details are given right below on the base. And oh! 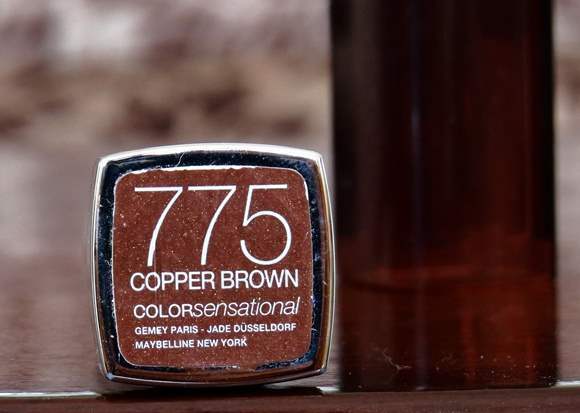 Since 775 Copper Brown shade has a shimmery finish, the sticker was given a shimmery effect. It’s pretty and also, users get to know the texture of the lipstick. The first thing that I noticed while opening the case was its fruity toffee fragrance. Love the smell; I’m guessing we’re off to a great start! 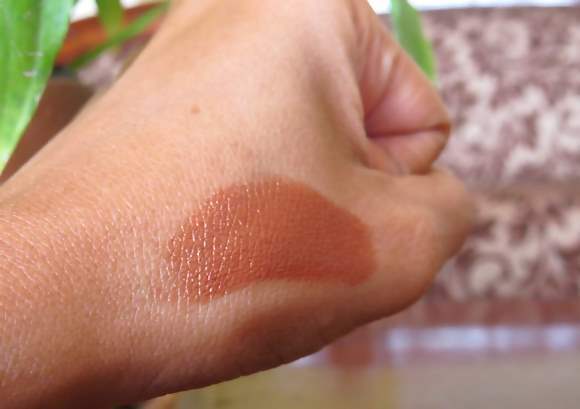 The shade, as you can see, is quite natural even with its shimmery pigment and sits well against my skin tone. It has a soft texture and glides smoothly; the resulting color has a light glossy effect with just a hint of shimmer. 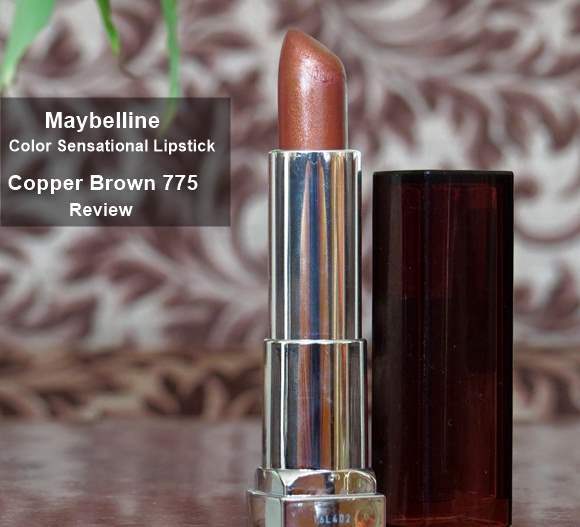 The Maybelline Color Sensational Lipstick Copper Brown 775 gives off a beautiful copper brown shade, not loud at all and perfect for daily wear. 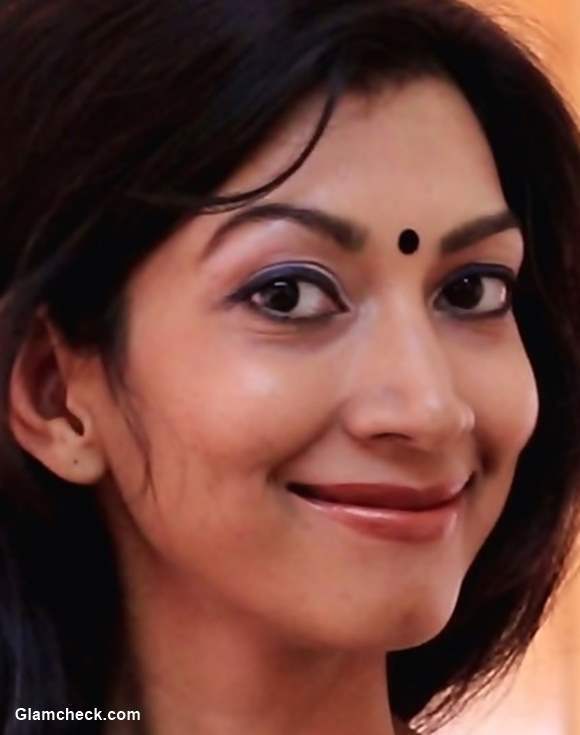 What I love is that the lipstick is well pigmented. So, I don’t have to pile on the lipstick to get the desired color, just one glide was enough. Even better – it has sun protection too. So, light enough for daytime wear and just the right shimmer for festive wear, this one’s a favourite! Maybelline Color Sensational Lipstick comes in 33 shades, I’m pretty sure every girl will find their perfect color.